"Adventure is not outside man; it is within." We've got a lot planned in the time we're going to be at Denali National Park. We didn't waste any part of our second day here -- our first full day. We're basing much of what we do each day on the weather. There are things we can do inside on rainy days. When it's nice, we want to be outside as much as possible. View across Horseshoe Lake this afternoon -- definitely a good day to be outside! This was another almost-perfect weather day, although it started off pretty chilly in the low 40s F. It was partly sunny and the temperature at our campsite reached 70 F. by mid-afternoon. It felt even warmer than that on sunny parts of the trails I hiked, especially high on Mt. 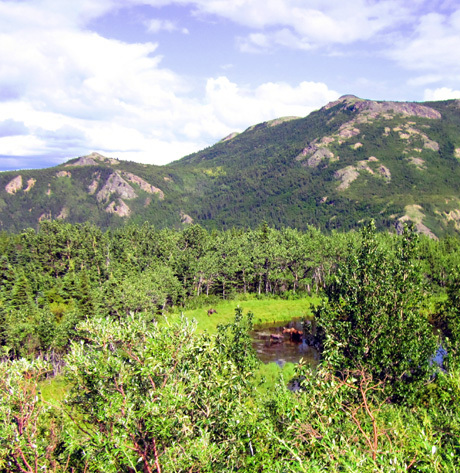 Healy Ridge. By late afternoon it was more cloudy and we had a few sprinkles of rain in the evening. Hopefully it will clear up by morning so we can see all or most of Denali. Jim spent a while today researching flights over the mountain. 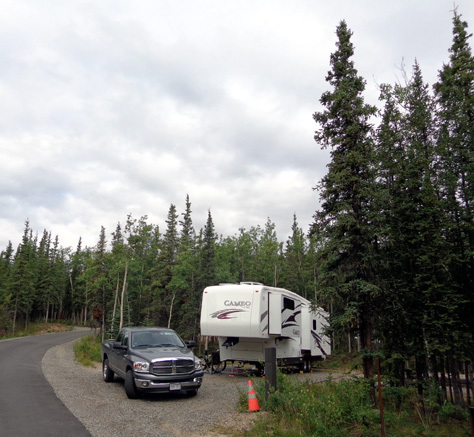 When he asked CJ, the campground host, for advice and recommendations, CJ said he could get him a good discount with either of the companies that flies out of this area instead of having to drive back down to Talkeetna. His referral turned out to be better than the 10% discount the company offers military folks. We talked about our options a couple times on the phone while I was hiking. I had a strong cell signal on all the trails I was on today. are probably similar to those from a low-flying plane. We'll see tomorrow . . .
Jim booked and paid for a flight with McKinley Flight Tours for tomorrow at 9 AM. The company is based in Talkeetna but also picks up customers at a campground a few miles north of the national park and transports them in a van to the airport at Healy. Healy is about ten miles north of our campground. There will be nine passengers plus the pilot on board. Jim asked if he could sit up front with the pilot and was told he could. 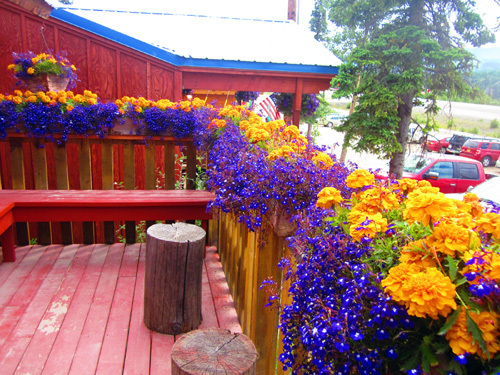 We�ll see how that works out, since any passengers from Talkeetna will be onboard first. I just hope we can see the mountain and we can take some spectacular photos. 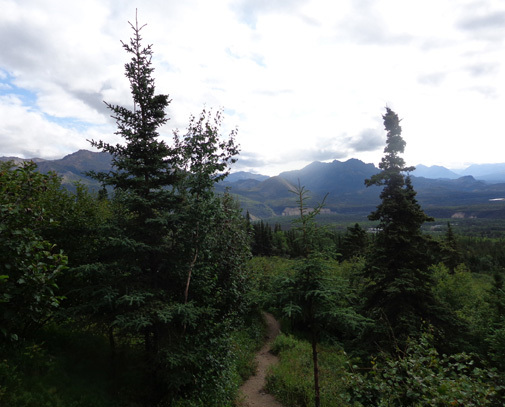 There is a 20% chance of rain tomorrow at the campground but the chance of clouds obscuring Denali is always high. It's a real cloud (and bad weather) magnet. 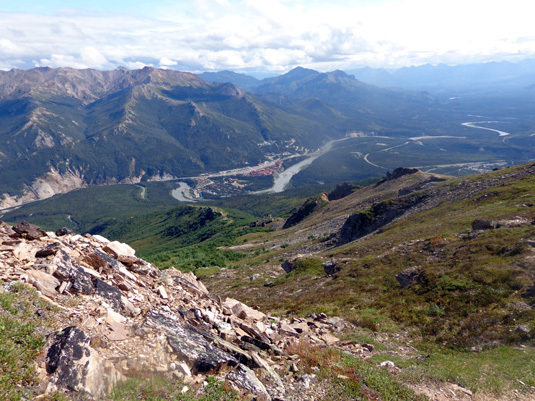 As previously mentioned, we have a lot of things we want to do while we�re here at Denali, especially the first three days when it�s supposed to be partly sunny. We also have to get more supplies before we head back to Teklanika River Campground on Wednesday. Once we're back there, we can't drive our truck back out to the park entrance until next Sunday. He was able to pull off the highway far enough to avoid getting hit by passing vehicles but didn't have our better digital camera with him so I can't zoom in real close on the three photos he took. 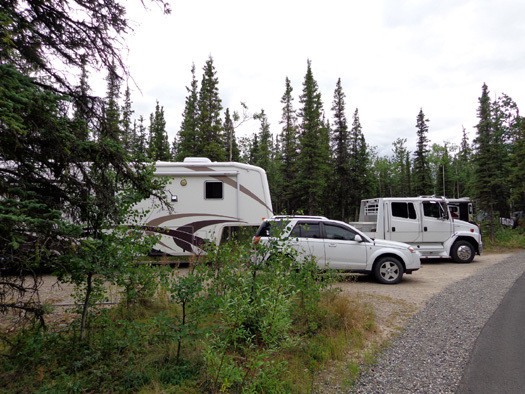 On the way back to the campground he picked up two Thai dinners for supper at a little trailer in Nenana Canyon AKA �Glitter Gulch.� The food was pretty good, considering the source (i.e., not a "real" restaurant). He also stopped in the Mercantile building to extend our second stay at Riley Campground by two days (next Sunday to Tuesday). We like it here, the price is right, there is a lot to do even if it�s raining, and we have internet service. Jim got in an eight-mile bike ride, although it was more difficult riding on the park road out to the park headquarters than he expected. 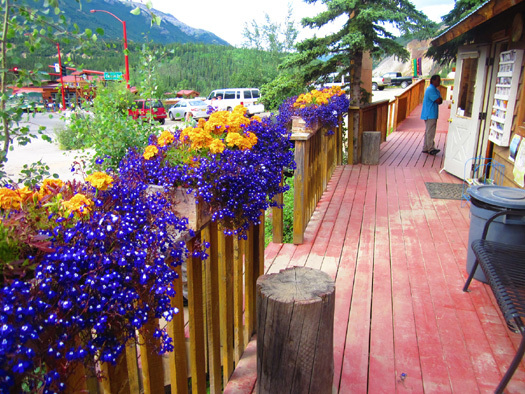 We�ll probably take the free park shuttle bus when we go out that way to see the sled dog kennels and demonstration. There isn�t much vehicle parking so folks have to ride the shuttle, ride their bikes, or walk. While Jim was out on his bike he stopped at the main Denali visitor center and browsed the exhibits. I showed photos from there in one of yesterday's entries. As he was riding his bike through our campground Jim noticed a Virginia tag on a car pulling a little trailer. He stopped to talk to the couple � they�re from Fincastle, near Roanoke. Small world! Another small-world phenomenon today: CJ-the-campground-host noticed the neon yellow ultra running shirt Jim was wearing from the Mississippi Trail 50-miler while he was riding his bike and asked him if he knew Carl Touchstone, the original race director for the MS 50 races. CJ is from New Orleans and used to run marathons and a couple ultras. Jim never met Carl Touchstone but I did at the Ice Age 50-miler in Wisconsin back in 1998. Unfortunately Carl died before Jim and I ran the MS 50 race several years ago. Carl was well-known and liked in the ultra running community. While Jim was busy making reservations, running errands, and riding his bike, I spent over six hours hiking on the Mt. 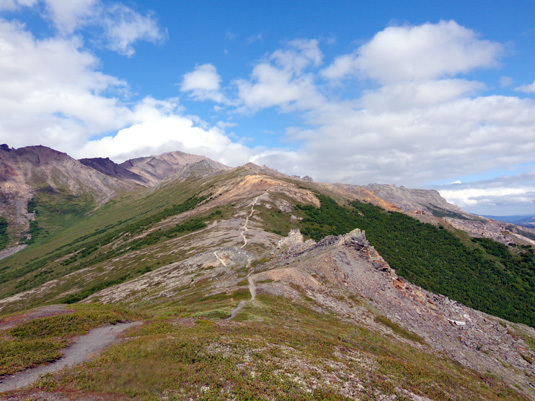 Healy Overlook, Taiga, and Horseshoe Trails. I'll write separate entries about those. The best part of the hike was beyond the maintained trail, up on the ridge. What magnificent views! In the afternoon I returned to the camper via the bike path. We see large 5th-wheels and travel trailers pulled by big ole trucks rather frequently. Can't imagine how much those things cost! We're lucky we can safely haul our 36-foot Cameo with a diesel Ram 2500 3/4-ton pick-up. We just have to watch how much water, food, and other things we carry in the camper or we'll be towing over a safe weight limit. 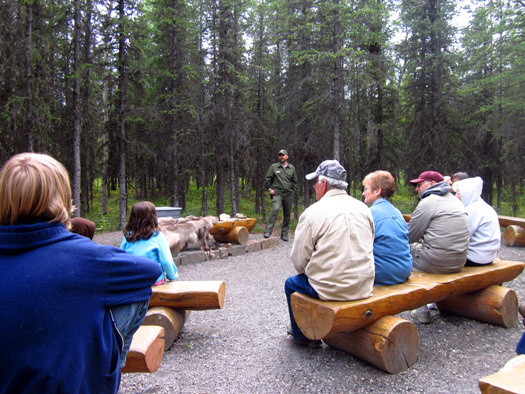 Since we�re camped so close to the amphitheater in Riley Creek Campground I walked over at 7:30 PM for tonight�s ranger talk, which was about wolves. Jim opted out. There were about 25 people in attendance, from young kids to folks in their 70s. 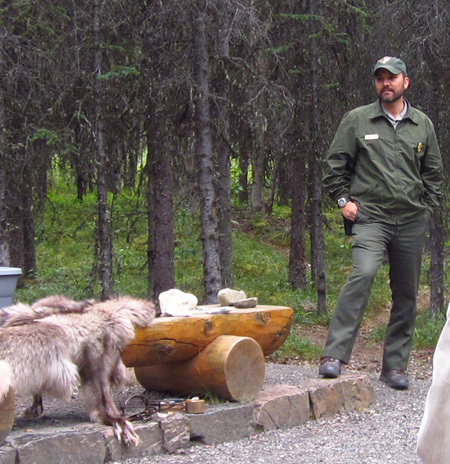 The ranger gave all sorts of information about wolf behavior, life cycles, and their role in the ecosystem at Denali National Park and other wilderness areas. 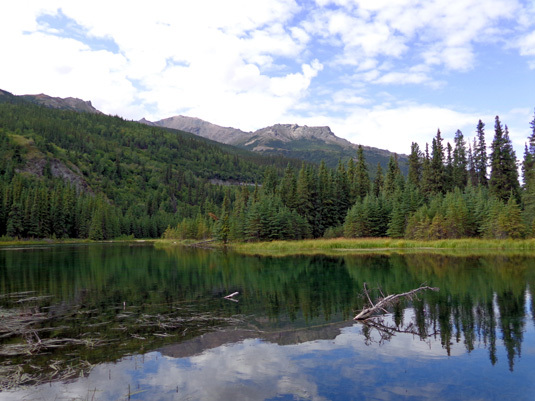 Denali NP is one of the best places in the world to see wolves in the wild. 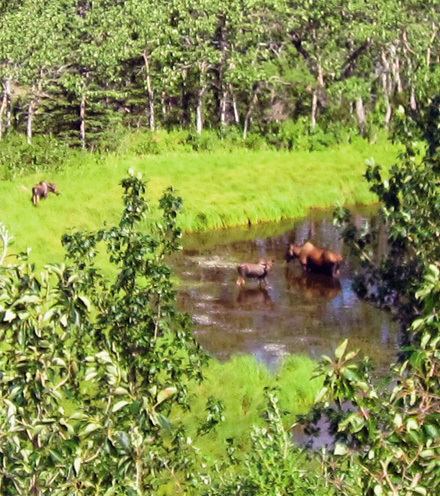 We hope we'll see some in the backcountry on our hikes, bike rides, or bus rides in the park. There are many fewer wolves in the park than some of the other Big Five** critters, however, so our chances are slimmer of seeing any of them. Biologists have been monitoring wolf populations in Denali since 1986. For various reasons (some unknown), wolf densities in the park have been the lowest the past three years since 1987. That's another reason we'll be lucky to see a wolf while we're here. The ranger gave a safety talk re: bears and moose first. Apparently that's routine with all the rangers who give these nightly presentations because visitors are highly likely to encounter either species along the park road or while hiking in the backcountry. He told us what to do in case we encountered a brown/grizzly or black bear (same info as in all the park literature and on the interpretive panels) but didn�t mention bear spray. He did say bear bells aren't real effective. I had both bear spray and a bell with me while hiking today. Even though the Mt. 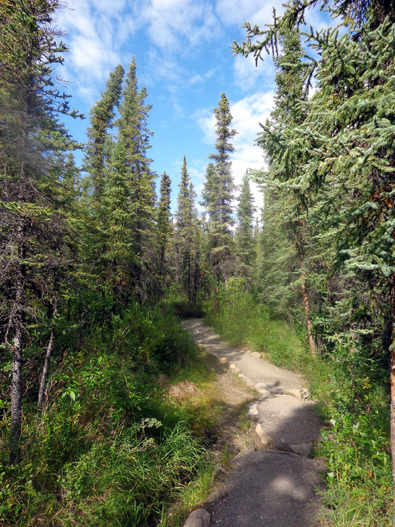 Healy Overlook Trail is in the "front country" it's somewhat remote through dense taiga (boreal forest) where I might surprise a bear while I was walking alone.